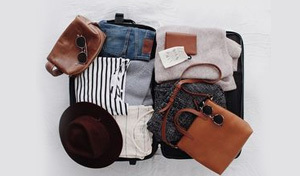 For holiday or business trip, every woman should have their must bring items list. What are those seven things should be brought in your every trip? Check this out. For international or domestic, it always first thing to bring your ID, whether citizen card or passport. Without ID, your trip will stuck on airport or station. Bringing your ID is also important when you go by car, not onlu for a trip regulation but also for your own safety. Make sure your ID is not expired yet and it’s a good idea to spare its copy on your bag or journal. Just in case. Especially if you go for travel business, make sure your cell phone and its accessories such as cbharger and universal adapter plug are ready on your bag. In urgent situation, these things will helps. Take your ear plug too to enjoy your trip or if you need a good sleep at night in hotel. Who wants to miss every single fun and special moment during holiday? No one. That is why camera is one of essential things you should always bring. No need DSLR camera if you are not really pro using it, a handy mirrorless camera is enough. Dont forget to pick one best moment to be posted in Instagram. Bringing a pack of wet wipes will keep you clean and fresh. Wet wipes is really important especially when you using public toilet. So what are two functions of sunglasses for your trip? Most importantly, to protect your eyes from the sun, second of all to upgrade your look in a snap although you are without makeup. Last but not least, of course UV Protection produst! Always bring moisturizer and body lotion on your hand bag. It will keep your skin mistured all day long. Surya Majapahit Sun Protection Lotion from Dewi Sri Spa contains SPF 40 that will brighten the skin and protect it from UV A and UV B as the trigger of hyperpigmentation and skin burn. Say no to sunburn, Spa Lovers!